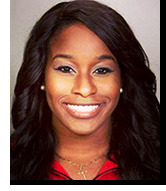 "Of all my experiences during my nearly 4 years at Miami, I guess my biggest feat was when I attained the school record in the discus throw and received a 4.0 GPA that same semester. This achievement made me realize that I had chosen correctly…the right coaches, the right professors, the right school." 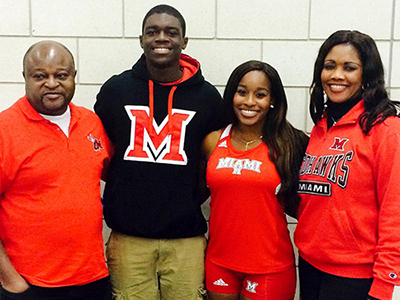 "I come from a strong, tightknit family with values in both athletics and academics. My older brother Kenny played football at Duke University and now plays for the Denver Broncos, my younger sister is currently a volleyball player at Case Western Reserve University, and I came to Miami on an NCAA athletic scholarship for throwing the discus and shot put. I also have a younger brother in high school who is currently being recruited for intercollegiate athletics, specifically football. My family encourages us to use all our talents and abilities, so whatever school we chose, it had to not only be athletically sound but academically as well. "I fell in love with Miami's small faculty-student ratio and having that one-on-one relationship with professors. When I go to my professor's office hours, the line isn't out the door, they're actually there, and they probably know my name. There are times when I miss Friday classes because I have an away meet for track, which means I usually have to make it up with the professor ahead of time. I've gotten to the point where I'm doing a week or two ahead, matching up my course syllabi with my sports schedules and informing my professors weeks in advance so we can find a way to accommodate our schedules. They are usually pretty receptive about this, so I love that Miami allows me to be a student athlete with an outrageous schedule. I don't feel like I would have the same opportunity at a larger school. Miami is really comfortable and personal. "Although I'm a student athlete, I'm really a student first, and at Miami I had to learn to balance my life. You have to learn how to work with other peoples' schedules, so you can have class, then practice, then class again, then practice again, and then a team meeting—just going back and forth all day. The NCAA places an investment in you, so being a student athlete is essentially like a job. It's a more serious commitment than in high school, and it's been a challenge at times to handle a college schedule. I've had a lot of sleepless nights, but I've also really grown in the areas of commitment and time management!" "I plan to go into the medical field, and via all the anthropology courses that I've taken I learned there's a patient-centered approach. It's no longer just about the biological aspects but the sociological aspects as well, so nowadays doctors need to know more about the patient's background and become more integrated in the patient's life. Anthropology has helped me look at the person in total, not just as a body. I feel like I'll be a better physician because I've learned about the anthropological aspect of a person alongside with the biological. If you combine those two facets, you can be a great doctor that looks at the person as a whole. "My older brother was also an Anthropology major, and seeing him go through the experience of balancing that with being a student athlete gave me hope that I could do it too. He gave me a lot of the tips about developing interpersonal communication skills, working with people back and forth, and picking up on linguistic cues. It was nice to have footsteps to follow in rather than having to create my own. "My parents both came over here from Nigeria. My dad was the person who kept me so driven, using every facet of my identity and skill to the best of my ability. He put his head down in the books and got his PhD in architecture and went back over to Nigeria to build an apartment complex for his family to live in. Every time I think I can't do something or feel like I've got too much on my plate, I just reflect on my father's story. He and my older brother remind me that yes, it's hard, but it's not impossible, as long as I keep my head down and keep pushing and keep myself strong. I'm so energized and geared toward a goal that I feel like superwoman a lot of the time! The only reason I look back is to see how far I've gone. "Many Miami professors have helped me achieve this, including Mark Peterson, Cameron Hay-Rollins, and all of the other professors in the anthropology department. When I asked Dr. Hay-Rollins, for example, about how I could integrate my Premedical Studies co-major into anthropology, she empathized with my situation and had some really good suggestions. Miami is such a community that you can't slip through the cracks here. Someone's going to notice if a student needs help. The minute I start going low, getting close to empty, someone comes and fills me up." "I think I came into college with more of an open mind about a lot of things, and now I've become more learned about other cultures and beyond just what's outside my front door. Miami has helped me explain more of what's out there, to diversify other people's perspectives. I feel that my liberal arts education has given me the ability to go on and educate the world and help get rid of some of the ignorance that exists out there. 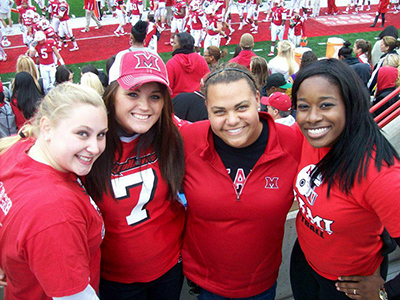 Adaora Anunike and teammates pose at a Miami football game. "Before I went to college, I used to steal my brother's anthropology homework all the time. He's 3 years older than me, and he'd come home from Duke with his anthro homework, and I'd sneak in because I was so curious. A couple of times I found myself reading some of the articles and becoming really engrossed in cultures that are different from my own. The world is already so big in my snow globe, and then you realize that your snow globe is in a store full of snow globes! I love sitting here in a classroom to break down cultures, as if you're breaking down a molecule. I feel so passionate about it because I'm learning so much of the basics and getting down to different points of view, different cultural values, how other people live, how other cultures used to live, and gaining more modern skills. Not only can I explain much of the past, but there are some new things I am learning about explaining the future. As a Premedical Studies co-major, I feel like I'm supposed to like biology, but I really like linguistics and anthropology more than anything. They say that if you're a people watcher, you're an Anthropology major! I was always interested in people's different ways of thinking, and what was so awesome was that I found a major that actually gives me college credit to dive into that! "I always tell people that Anthropology is the most difficult, most interesting, most knee-slapping, most bent-over kind of a major I could have ever chosen. I've heard other people talk about their majors, but no one I know talks about their classes outside of class. Anthropology majors come out of class and talk about some ethnography we read about baby talk and how people speak to their kids, and I'll say, "That’s so true! I'm so glad someone analyzed that!" I tell people some things we learn, and they always say it sounds like a fun class. Some people think that anthro is so hard and there's too much reading, but I could read thousands of pages if they were about something I like to read. And that's what matters." 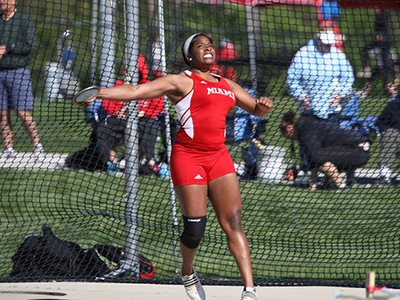 Adaora Anunike prepares to throw the discus. "Of all my experiences during my nearly 4 years at Miami, I guess my biggest feat is going above and beyond while simultaneously juggling both my academics and my athletics. This culminated last year, as a junior, when I attained the school record in the discus throw, and this was a huge thing for me because I had also received a 4.0 GPA that same semester. I felt like I was on top of the world! "This achievement made me realize that I had chosen correctly, and there's nothing like that instant gratification when you feel like you made the right decision about something. 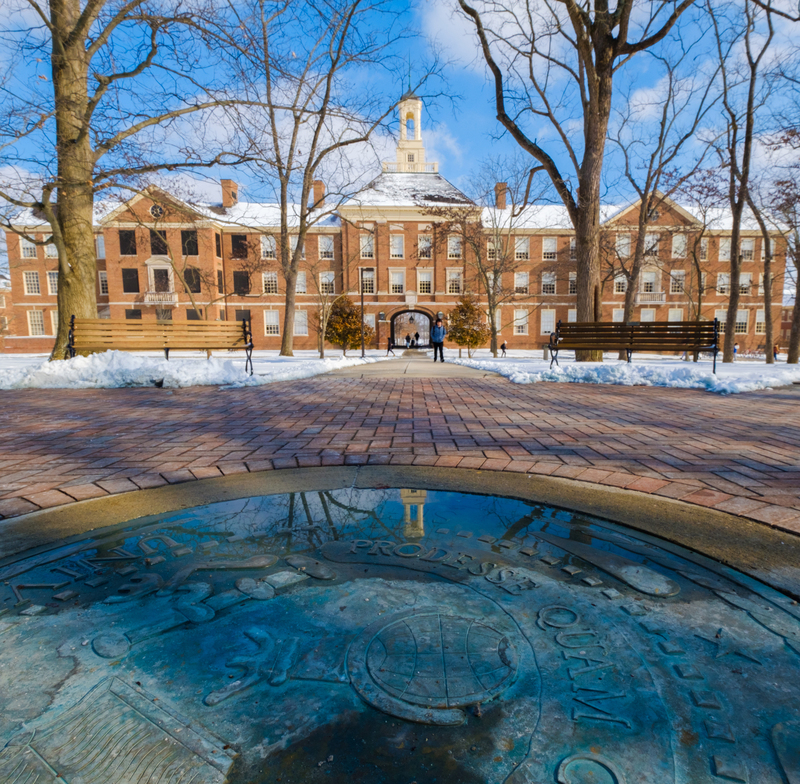 The right coaches, the right professors, the right school. It felt really good to be validated. "Hopefully I'm not at the peak of the mountain just yet. I want to keep climbing and finish up strong. I've been doing track since 7th grade, and I'll be throwing a discus just a few more times—and then it'll be over and time for the next step in my life. I don't know how it's going to feel. It's just been so long, doing athletics and academics, but soon everything will split off, and not everyone does the same thing after that point. Stepping into the unknown is what's to come. "After I graduate, I would like to go ahead and do a post-baccalaureate program where I brush up on my pre-requisites and learn how to be a good medical school student and really just understand that kind of environment before I jump in. I want to take a break, fill up, and change my tires before racing on once again." "Talk to your faculty advisor or a professor in a department that you like and have them turn you on to an article, some sort of reading that will really spark your interest. The minute I first read an article in anthropology, there was no getting me away from it, there was no breaking ties. It became my passion, and they say if you're passionate about something, you'll never need to work a day in your life. The minute that I felt like I was not only learning but also enjoying learning was when I noticed that anthropology is where I was supposed to be, and this is what I can imagine myself doing for the next 4 years. "It's also important to learn how to say no. It hurts and it's hard, but a lot of people have wanted to put me in the forefront or say, "Look at this girl, she's being successful, we've got to tell everyone, show her off!" But one part of my success is that I can't do other things! There are certain times when I just have to tell people I cannot make that commitment, because the worst thing you can do is make a promise and find out that you can't follow through with it. At that point you're letting someone down and leaving them in a position where they have to find someone else. So if you feel like something is going to be way too much on your plate and you're going to be dropping the ball on projects or meeting times or any type of commitments, just go ahead and say no. Though sometimes I feel like it, I'm actually not superwoman, regardless of what nicknames might be tagged to me. "Overall, Miami has been great because not only have I been juggling two big responsibilities, athletics and academics, the best I could, I was also doing them well. I've kept both balls up in the air. I've worked so hard over the years, trying to figure things out, failing and falling and getting up and scraping my knees, sometimes not wanting to get back up, and taking some rest for a second to gather myself. But the minute I achieved a 4.0 and broke the school discus record, everything just came together. That was just such a moment for me. It's not something that I'm going to forget, and I'll remember that I did it here, at Miami."